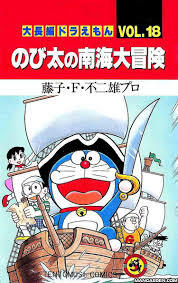 Doraemon’s story is full of fun and entertainment. Where nobita,gian.shizuka,suneo,perform multiple acts. Doreamon is a robotic cat. Doraemon can do anything with the help of his gadget. Doraemon and nobita live in nobita’s house. 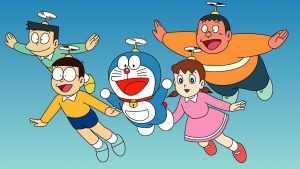 Doraemon entertains nobita a lot by his different acts but nobita’s mom is so upset from Doraemon and nobita’s strange acts. Nobita and his friends would like to spend school holidays at any comfortable place. Gian and suneo decide to go spend there holidays any attractive place where they enjoy their selves a lot. Nobita is not happy he would like to go with his family somewhere but his family does not agree to go with him to spend nobita’s holidays some comfortable picnic place. Nobita sits angrily. 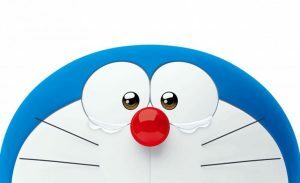 He asks Doraemon to do something but Doraemon denies he couldn’t do anything. Nobita suddenly finds a bag in his room when he opens it opens same like Doraemon’s any way gate. Nobita shocks to see this amazing gate. Nobita shows the door to doreamon and both of them enter the door. They say amazing things which are made of plastic. Immediately car comes to nobita and Doraemon sit in the car. The car stops in front of the big hotel. Doraemon and nobita come down and they enter the hotel. Slowly they walk away where robotic kind of people welcome them zealously. Nobita and Doraemon take dinner with them happily. Nobita and Doraemon go back after few time. Nobita shares the secrecy with gian and suneo. Gian and suneo agree to go and see this amazing place. Doraemon,nobita, Shizuka, Gian, and suneo enter the door and reaches the strange robotic kind of world. Suddenly aliens come they kidnaped Doraemon and law him with oneself. A boy lives in the hotel. he says to them kindly help me some aliens caught my father and they are not letting him back. Nobita and his company agreed to help the boy. They enter in the bhool bhulaiya laboratory with boy, on the point other robotic creatures attack them. Nobita and his company fight bravely and bring back boy’s father saved. The boy is so grateful and thanks, full to them. 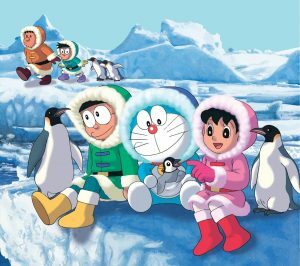 Doraemon’s in this story they all friends help the boy where his father flatter by aliens. They all fight with them bravely and brings back boy’s father boy was so happy to them that his father comes back with the help of nobita doreamon and there friends.